Though ​Italy is increasingly moving to digital, paperless train tickets, you may still feel like you're overwhelmed with tickets, receipts, and other little slips of paper during your Italian vacation. When it comes to Italian train tickets, bus tickets, and restaurant and bar receipts, each of these papers requires you to do something to avoid a fine (or embarrassment) as you travel in Italy. The photo above is of a second-class train ticket for a regional train departing (partenza) from Milano and arriving (arrivo) in Pavia. In order that the ticket not be reused, it must be validated before you get on the train. This means you must find a green and white validation machine or in some stations, the old yellow validating machine. You'll stamp your ticket(s) by sliding the ticket into the slot on the machine until you hear the mechanical crunch of the stamp. You'll see the date and time stamped on one end of the ticket when you remove it from the machine. Then you're set to board your train, which you can do at any time it's in the station. Note that this is an ordinary train ticket that requires validation. On fast trains like the Frecce trains, where a reservation is required, tickets don't normally require validation since they specify the train's exact date and time on the ticket. Like train tickets, bus tickets need to be validated before your journey. Most times this means that you'll board the bus, find the validating machine near the entrance, then push your ticket into the slot, arrow-end first, until you hear the mechanism grind away. Most of the time you'll need to buy your ticket before getting on the bus, usually at a tabacchi, newsstand or bar, or at the bus station ticket window. In some cities, you may also find automatic ticket vending machines near major bus stops. This bus ticket was for an airport shuttle bus ride. Notice the validation code under the arrow. You do not need to show your ticket to anyone unless requested to do so. But a transport officer can board the bus at any time and request to see validated tickets. You may be surprised at the vigor with which Italian restaurant, bar, and business owners thrust receipts into your hand. There's a reason for this. The owner can be fined a great deal of money if a representative of the Guardia di Finanzia (literally the "financial" or "tax police") confronts you while you're coming out of a restaurant without a receipt. The practice is in place to discourage under-the-table, or nero sales on which owners/vendors don't pay taxes. 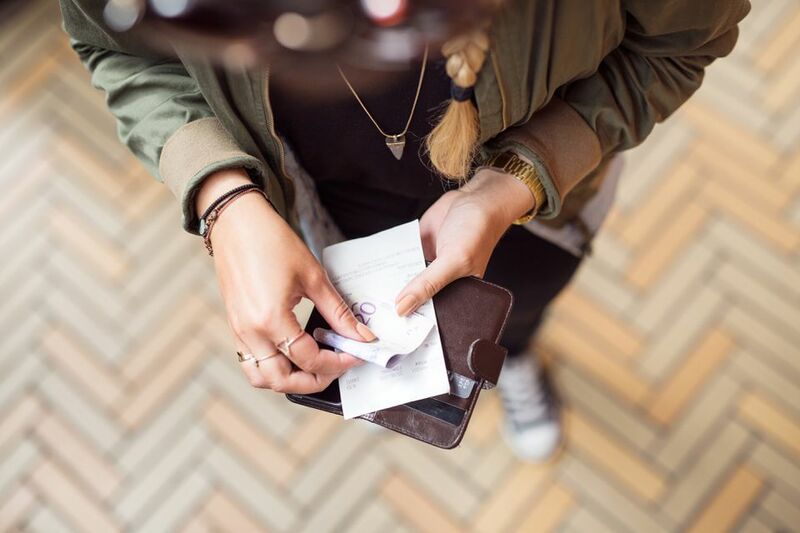 Every purchase, from a pack of gum to a coffee to dinner, requires a written receipt. What Is a Proper Receipt? The picture shows a proper Italian restaurant receipt. This is a ricevuta fiscale that is in compliance with the law. It has the address of the establishment, the date, and a list of the food consumed. While some restaurants will give you random pieces of paper with only the final total written on it, these are not legal ricevute fiscale. This receipt from a restaurant in Torino is really simple. The diner had a menu a prezzo fisso. This is typical at lunch, a price fixed menu that includes the cover charge, service, beverage and usually two or three courses of food. If you order from the a la carte menu, you could expect to see a small cover charge (coperto), and numbers in the left column corresponding to the items on the list. Service might be included in the price (as it is in the fixed price option), or it may be broken out separately. What Do You Do With a Bar Receipt? Like the restaurant receipt, you'll want to keep the receipt they hand you in an Italian bar for at least 100 meters after you leave the place. This also applies to shops. Once you're out of the bar or store, you can toss the receipt in the nearest garbage can. This is the receipt from a bar in Torino. The receipt has the address, telephone number, tax (VAT) number, and a list of the items consumed. In larger cities, you'll line up to get a receipt before you order your coffee. Then you'll belly up to the bar and show the receipt. Sometimes the barista will tear the receipt to keep track of what's already been served. You're still required to take the receipt with you when you leave.